Today February 12th is Charles Darwin's birthday, and my dear little Sister's birthday too (A card is in the mail, Sis. ); she's just a tad more than 1/4th as old, which sounds much worse than it is as this is Darwin's 206th birthday. In years past TPP would have cake and get out his Darwin library (10 of his books) for his students to peruse, but this year not. So here's your tiny dose of Darwin: "We now come to the nyctitropic or sleep movements of leaves." 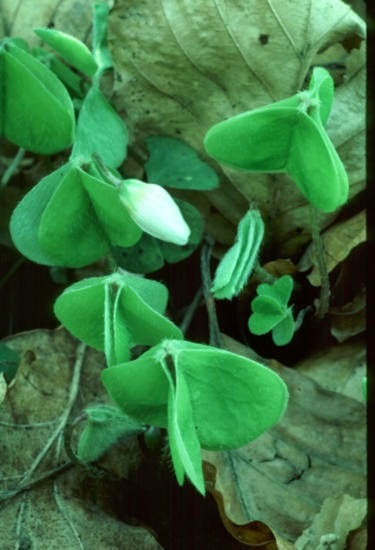 (The Power of Movement in Plants, 1880) The image shown is a species of Oxalis, a wood sorrel, which have leaves with three sort of heart-shaped leaflets. Darwin devoted several pages of this book to describing their sleep movements. Sleep movements of leaves occur in many plants characterized by a drooping of the leaf and a folding of the leaflets such that half as much surface area is exposed. Reading his books leaves you impressed by Darwin's powers of observation.